The City of Dubai ist getting more beautiful these days. With the DUBAI STREET MUSEUM the first contemporary street art event of its kind takes place in the streets of the district Al Satwa. This event will bring some of the greatest contemporary street artists to the United Arab Emirates for the next five years. The first phase of the event is currently running at 2nd of December Street and international artists like CASE, 1010, ERNEST ZACHAREVIC, HUA TUNAN and SETH THE GLOBEPAINTER already finished their murals. As one of the first it was JULIA VOLCHKOVA who finished her portrait of a traditional inhabitant of the United Arab Emirates, who’s riding a classic wooden boat through the traffic of the city. With her current artwork, JULIA VOLCHKOVA is bringing the curated theme „The Past“ in context with the modern everyday life on the streets of Dubai. 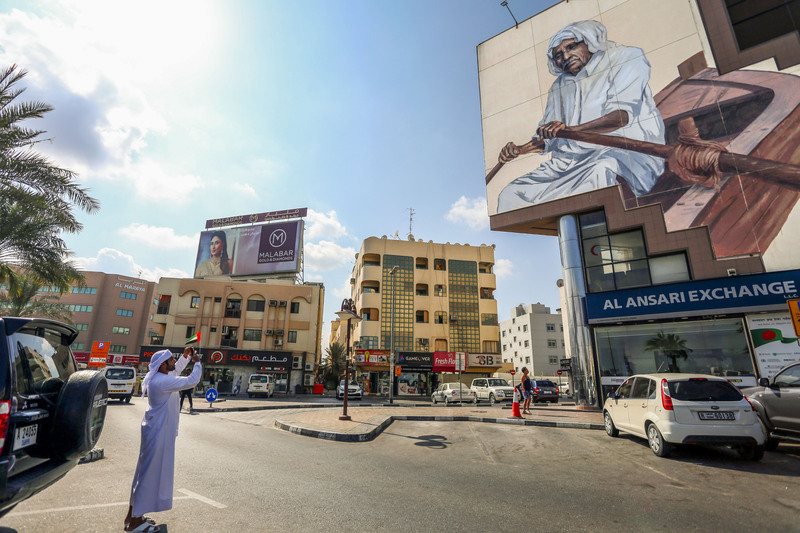 The mural for the DUBAI STREET MUSEUM shows the class of this extraordinary artist and underlines the high standard of the selected line-up of artists, the curators Rom Levy and Sanaz Askari put together for this unique event. On our walk through the DUBAI STREET MUSEUM, today we put are focussing on the artwork of JULIA VOLCHKOVA in the streets of Dubai. JULIA VOLCHKOVA, born in Siberia, Russia and living in Thailand, is one of the most upcoming Russian contemporary street artists. Her nearly photorealistic works are detailed masterpieces of fine arts, implemented with techniques she learned in a classical art education at the University of of her hometown Nizhnevartovsk.